The Arizona State Courts Building symbolizes how far the judicial system has come in Arizona since the days of the first territorial courts. In May of 1864, Justice William T. Howell resigned his territorial appointment. Howell explained to Governor John Goodwin that he could no longer reside in a district where two out of three people were barefoot and where court was conducted in an adobe shack with an earthen floor and a dry goods box as a rostrum. The following pages contain information regarding the attributes of the Arizona State Courts Building and how Arizona came about this spectacular building. We think you will find the information very interesting and very informative. Justice James Duke Cameron and Judge Joe W. Contreras were largely instrumental in obtaining the purchase-leaseback financing needed to construct the building. They spent nearly 10 years obtaining funding, (Judge Contreras' family had a home on this site, and he was born here more than 60 years ago.) The property stood vacant for many years but finally was acquired by the state as an extension of the governmental mall extending east from the Capitol. 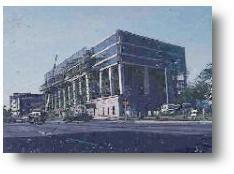 Initial design of 1501 West Washington began in 1984. 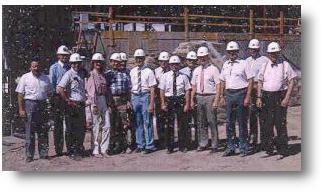 Groundbreaking ceremonies were held January 13, 1989. 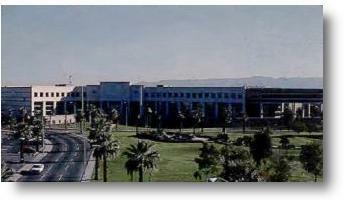 The dedication ceremony was January 29, 1991, with Warren Burger, retired U.S. Supreme Court justice, as the speaker. Tenants began moving in about March of that year. 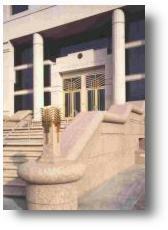 The words "Arizona State Courts Building" originally were to have been etched in the marble about the main (north) entrance, but the justices wanted a more significant statement. They chose a partial quotation -- "Where Law Ends, Tyranny Begins"..submitted by John P. Frank, Esq. 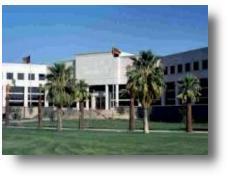 of the Phoenix law firm of Lewis and Roca. The full quotation was contained in a speech by Lord Chatham (William Pitt) entitled "The English Constitution" delivered in the House of Lords in reply to Lord Mansfield in the Case of Wilkes, January 9, 1770. The full quotation reads, "Unlimited power is apt to corrupt the minds of those who possess it: and this I know, my lords, that where law ends, tyranny begins!" The PA system in the courtroom is on full-time because turning it off and on creates too much wear and tear. "Duck-blind" partitions are used to conceal any video cameras used by the news media (use of cameras in the courtroom is controlled by a specific rule). A control room is located west and south of the fourth floor courtroom, and a technician is always inside, able to control audio levels, during oral arguments. 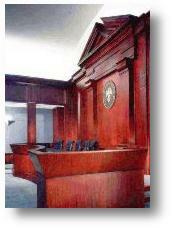 Initially, the PA system in the courtroom used speakers mounted underneath the seats. These proved ineffective, and are now inoperative. New speakers were installed in the mahogany pillars on the east side of the courtroom. Sprinkler heads for fire prevention in the fourth floor courtroom are nearly flush with the ceiling. They would drop about 6 inches if they were activated (activation temperature is 165 degrees Fahrenheit). The wall paneling in the courtroom is soundproof. Custom-made panels are from New York. The brass inserts between mahogany panels are 1/4" bar stock. When the courtroom first was built, there was a problem with expansion of the mahogany panes, so the panels were cut, and the brass inserts installed. Humidity in the courtroom is usually about 6 percent. Ice water from the chiller system in the basement originates at 32 degrees Fahrenheit. When it reaches the fourth floor it's about 38 degrees. The entire exterior of the building, including the roof, is rubberized with the exception of the windows and entryways. It is forbidden to punch any holes in the roof without permission from Goodyear, who then sends out people to ensure the puncture point is resealed with rubber. 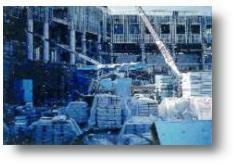 The building is cooled by ice chillers which are the biggest of their type. Two chillers, each rated at 175 tons capacity, make ice during the cool desert nights which melts during the day to help cool the building. The Security Desk on the second floor can visually track movement in the building using 44 security cameras. Most stairwells are equipped with motion detectors which activate cameras if a person enters and goes up or down the stairs. The magnetic entry cards used by employees identify specific card users each time the card is slid through one of the secure area entry scanners. Particularly sensitive areas such as the computer equipment areas have even more restrictive card readers, which allows entry to only a few authorized employees.